I was extremely delighted with my iPhone4 battery life. With my work exchange mail and gmail set to push and normal use, I could go about two days sometimes without needing to charge. I would go to bed with say 60% charge and wakeup with 58% remaining. When I installed iOS5, this all came to a crashing halt. Initially I though it was the new iCloud stuff doing an initial sync or backup, but after a few days the drain continued. I tried the multitude of things from rebooting, to turning off location services, removing some unnecessary items from the notification center, pretty much everything in the book. While this alleviated the situation partially, it was nowhere near what it was pre-iOS5. I read through most of the postings on the Apple forum regarding this issue ( https://discussions.apple.com/thread/3387864 ). One posting in particular mentioned a process taking up 50% cpu. I'm not sure how he measured this process, but it dawn on me to cold boot the phone rather than warm boot. Unlike a computer, warm booting (sliding the red slider after holding the sleep wake button a few seconds) the iPhone saves the state of the apps and presumably the running processes and returns them back to the original state after the phone starts up. If you don't believe, try warm booting and then go into to running tasks (double clicking home bottom) and you'll see all your previously launched apps still there. To make a long story short, while I did turn off some features (I'll list them below in case it helps some folks) I feel the cold boot is truly what returned the iPhone back to its pre-iOS5 battery consumption. Cold booting is simply holding the home button down while simultaneously holding the sleep/wake button for a few additional seconds after the red slider to shut off appears until it turns off on its own and then pressing the sleep/wake button to turn it back on. Today it charged to 90% while driving to the office and by lunch time it was 87% -- now that's definitely pre-iOS5 battery life! During lunch, I used it for a while dropping it to 83%. By the time I arrived home in the afternoon it was 80% (I didn't use it much for the remainder of the day). Once home I did a 20 minute jog with RunKeeper gps-tracking me all the time while listening to streaming podcasts via stitcher. Looking at my phone now after a few hours after the jog, its at 69%. So I can claim with certainty, the pre-iOS5 battery life has returned. So, first thing you should try is cold booting the phone. Just in case it's another culprit, I'll list a few of the other changes I made. (i thought bookmarks where probably the culprit after realizing the bookmarks are constantly in sync and it coincidentally has a history folder I presumed was syncing constantly as I surfed on my work and home iMacs). Is Apple another bargain when the stock opens 6% lower from the previous close? Imagine if Microsoft, a similarly comparable large company like Apple, would all of a sudden gain 54% in profit. Would its stock tank 5 or 6% because they didn't sell as many licenses of Windows as economists had projected? No, on the contrary it will rise like 10% on such profound news for typically lethargically large companies of their size. The funny thing, this is not a one time event, this is a continual event every quarter for sometime now and will continue for a few more as the world settles into the iPad as they did with the iPhone and of course the App Store, the only place you can legitimately buy apps for it, will continue growing too. The 4th quarter is going to be that much more of a smashing success with iPhone projections as the 3rd quarter wasn't because the sales of iPhones, which dropped in 3rd quarter due to lack of product launch in June, will fall over to 4th quarter from the iPhone 4S product launch. So of course, when comparing Q3 2011 to Q3 2010, there is inevitably going to be some differences -- especially with the successful iPhone4 being the growth factor then. To blatantly compare Q3 2011 with Q4 2010 in gross iPhone sales and fuss over the unsatisfied expectations has got to be the most misconstrued news I have ever heard. This only reinforces Peter Lynch investment style of investing in what you know and you'll beat the analysts every time. No matter which way you slice it, AAPL has 81 billion in the bank accruing at 6.5 billion per quarter, no debt, 54% increase in profit and product portfolios which are no where near becoming stagnant. New product revenue lines like App Store, iPad, & strongly increasing revenue from existing product lines like iPhone, MacBook, iTunes (#1 digital music store) -- it's a 100% no brainer this stock will continue to push upwards for the near future. Any drop should be considered a discounted buying opportunity. Oh, and this is before the announcement of their touch based iMacs which will lay slightly inclined on your desk similar to the iPad, still with a slide out keyboard for keyboard dependent apps , and any other new upcoming product line. I'll write again when the price is at 500 and I'll reassess the situation then to see if we can expect more. Buying now will give you roughly a 25% return from 400 to 500 within 12 months. Apple Stock today closed at 376.12. It's an extreme bargain. I just read various articles which simply justify my gut feeling. One reported iPhone4S sales so large in Britain, it became the #1 in sales, even beating Andriod -- a feat many people thought was impossible given the diversity of Android devices at various price points. Another article, states teens have listed iPhone & iPad with the same level of desire as cash and clothes on their holiday wish lists. Yet, another, from a financial perspective, compares Apple stellar performance in comparison to it's current stock price. Every financial metric used to value the stock have it as extremely undervalued. Anyone buying at today's price will reap an easy 30% gain on the way up to 500. Lets just hope the financial crisis doesn't bring a general recession/depression -- the only thing which could drag down the stock. If you are a Mobile user, particularly one with the new thunderbolt or display port connections, you may be considering the Apple Thunderbolt Display or former Apple Cinema Display. Since the iMac 27" are also usable as display via the nifty target display mode feature, this is an alternative I wanted to additionally consider. After various forums and research I came to the following observations which I'm currently experimenting with to configure the my ultimate docking station for my MacBook Air 11". First, lets start by laying down some facts as ultimate the facts which are more pertinent to your situation will have higher weight in deciding which direction to choose for your display needs. Below are some pros / cons when considering the use of each: 27" cinema display, 27" thunderbolt display, iMac 27" 2010 display port model, iMac 27" 2011 thunderbolt model. So having a brand new MacBook Air 2011, which one do I choose? Since the MacBook Air is very powerful, leveraging to the fullest the latest Inktel Core i5 processors, it can serve as my primary computer for most needs with the new thunderbolt display or former Cinema Display. However, these displays cost $1000 and for a few hundred more one can get an iMac 27" or even a cheaper refurbished iMac 27". With this dilemma lingering over my head while awaiting the arrival of the Thunderbolt display, also a candidate, I decided to explore possibilities. One such possibility was conceived as having very similar results to the Thunderbolt display was to utilize a thunderbolt hub as the intermediary between a display and the MacBook. 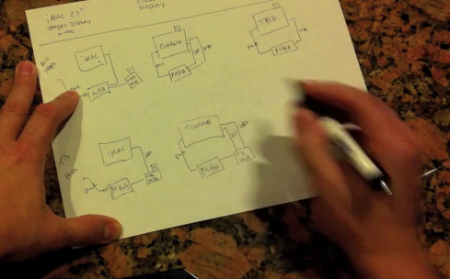 I recorded a video blog on the various possible connections here. In summary, with such a thunderbolt hub, one can plug a single thunderbolt cable into the MacBook as well as the power cord ultimately achieving the same functionality as the Thunderbolt display. So, interestingly enough though, no such hub existed at the time, however Belkin recently showcased their upcoming Thunderbolt Dock, with the same ports as the Thunderbolt display, making such a configuration a possibility. Since thunderbolts can drive display port monitors, using such a hub/dock with a mini displayport display should have straight forward compatibility. The next hurdle would be the accessibility of connected devices. No one wants to disconnect a device from one computer to then reconnect it to another -- let alone multiple devices. The Cinema Display and Thunderbolt display both redirect the devices to the connecting MacBook via their USB & thunderbolt connections respective, however a connected iMac in target display mode doesn't. So far I was leaning towards the one of the stand alone displays, however if a USB hub switcher existed where I can switch a device from one computer to another at a push of a button, this would allow for what I would call the ultimate docking station for a Macbook. So with this new device, in theory, I can leave my iMac 27", say, rendering a video off an external USB data drive while I can be working on the MacBook using another USB drive. Or a more typical scenario, I can temporarily redirect the time machine drive to the MacBook, let it do is incremental back, and then redirect it back to the iMac -- all with a single push of a button and without interrupting other USB devices who can be connected to either computer - WOW!. After searching forums after forum, I found one small niche company who makes such an adaptor. The device allows for 4 USB devices to be connected to 2 computers, mutually exclusive to each other and one computer at a time. The iMac & Air are connected via displayport cable. Port B of hub has my main data drive for video, etc. Port C has a simple USB hub where I attached my keyboard, mouse, has an extra vertical port for plugging in a flash drive from time to time. With this configuration, I can easily move time machine from one machine to the other with a push of a button. 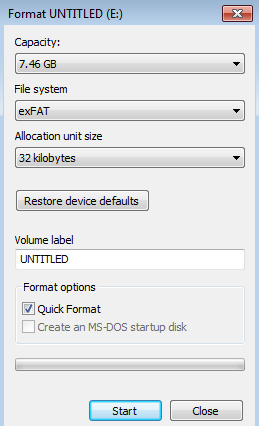 Or similarly, my main data drive can switch from one to the other. One benefit over the external displays is the ability to plug in external speakers to the iMac 27. These speakers are permanently connected to the iMac and work as any normal set of speakers with the addition of working with the MacbookAir when in target display mode. The current cinema & thunderbolt displays do not have this plug and as a result you need to plug in the speakers to the MacBook every time you dock if you want to use them. In summary, I have what I consider the ultimate MacBook docking station. As soon as the Belkin thunderbolt hub/dock arrives, this will change a bit, however it will be just as good or better than the thunderbolt display. Folks, I just came across the LaCie Little Big Disk Thunderbolt drives in the Apple store by chance. And surprisingly there are two versions -- the 1TB and 2TB disk versions. They will soon add SSD versions in the near future, however this is a welcomed surprise. From the looks of it, it supports a native RAID0 stripped set by default with 7200 rpm drives delivering an astonishing 250MB/s -- other configurations such as Raid1 are also available according to references. For a consumer oriented drive, these are speeds previously only achieved by expensive and dedicated NAS storage devices with similar raid configuration. If you consider you have two drives in one unit, effectively duplicating the price with a comparably sized external drive, the price no longer feels unreasonable. To save space and weight, the enclosure houses 2.5" drives rather than the typical 3.5" drives weighing a reasonably light 1.4lbs. 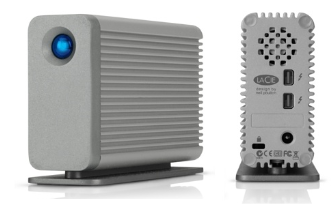 The solid aluminum construction is typical of LaCie's build quality and additionally serves as a heat dissipator for the drive internals. You will definitely want to have a time machine drive paired up to this speed daemon because unfortunately, the RAID0 effectively halfs the shelf life of the drive as failure of any of the two drives may effectively ruin your data. With today's reliable drives, this is less of a worry, however it's a prudent thing to do as this will surely be the primary working drive housing important data, such as home video's, given it's speed benefits. With the whole world waiting for the arrival of the Thunderbolt display, I just uncovered what would be the first official review posted online at MacWorld. You can use it with bootcamp, but booting into safe mode with F8 key at boot up time will require you to connect the USB keyboard directly to the computer rather than the display. Cinema displays attached to the thunderbolt displays will NOT work according to Apple, however MacWorld confirmed it works when a pegasus raid controller (and presumably any thunderbolt device) is between the Thunderbolt display & Cinema Display. This is what I deemed the first official Thunderbolt Display review. 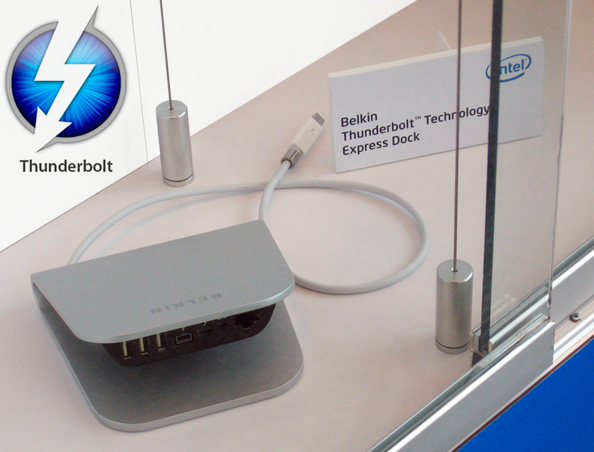 Belkin announced the first independent thunderbolt hub! This is a dream come true for those who do not want to dish out the $999 for an Apple thunderbolt display. 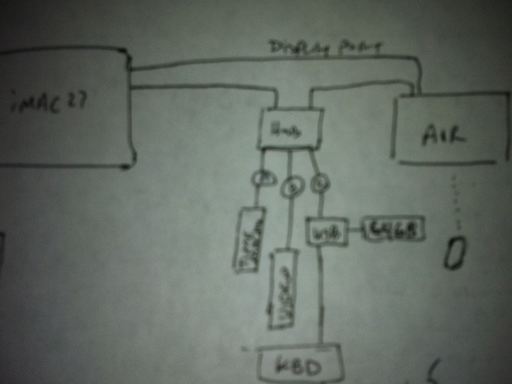 It seems to have the same ports: gigabit ethernet, 3 USB, and 1 thunderbolt for daisy chaining. 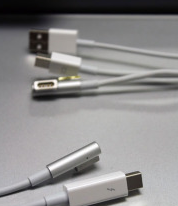 There is no release date specified and no price however however some speculate upwards of $50 since a thunderbolt cable alone from Apple is $50. Unfortunately, it seems the USB ports are 2.0 instead of 3.0 given the ubiquitous blue connectors USB 3.0 ports usually have. Lets cross our fingers though and hope for at least one USB 3.0 port if not all. With this, one needs to really consider if a less flexible Thunderbolt display is worthy over the more flexible Cinema Display. The cinema display would simply plug into this hub (including it's USB) and now you have the same configuration as the Thunderbolt display (need to plug in only one cable into your MacBook). The mini displayport technology in the cinema display is known to be more flexible than thunderbolt. As a simple example, many have connected their xbox 360's with the appropriate adaptor -- even the iMacs from 2010 can be used as displays for MacBooks within Bootcamp -- something the iMac 27" from 2011 with thunderbolt cannot.